Shot documentary style in the 1960s, A Time for Burning captures honest, balanced, poignant, and candid insights into race issues and segregation from a different era. In the decades since, some things have changed dramatically, while others are disappointingly the same. The film chronicles one minister’s attempts to nudge his all-white congregation forward by encouraging simple acts of intentionality in reaching out to members of an all-black church, of the same denomination, located only a few blocks away. The youth of each church make an initial effort by visiting each other’s church. Although the adults engage in much discussion—some hostile, others fearful, yet open—it doesn’t result in action. In an unexpected twist the minister who pushed the idea suddenly resigns, yet the cameras continue to roll. As such, there is no satisfying end to the saga, only insight to contemplate and unanswered questions that now seem more complex. 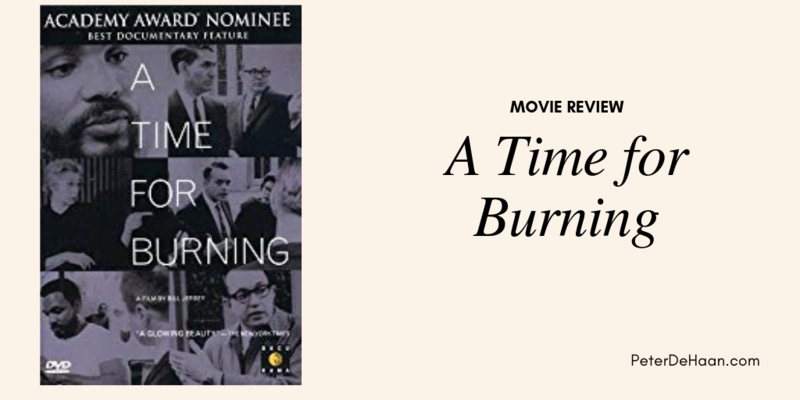 For those who lived through the 60s, the film is a powerful reminder; for those too young to know, it is a powerful glimpse into what once was and the bias and emotion that flailed against change.